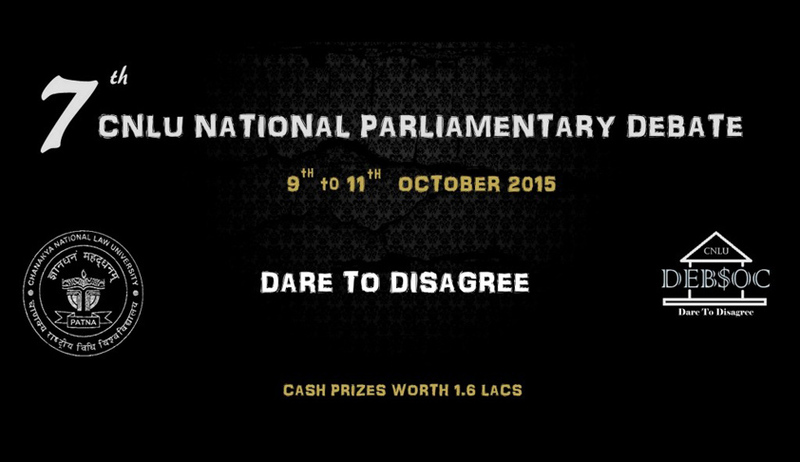 The Chanakya National Law University Debating Society has announced 7th CNLU Parliamentary Debate 2015 on 09th October to 11th October. CNLU is widely accepted and regarded as one of the premier National Law Schools for legal education, and merely within ten years of its establishment has cultivated not only the best legal minds, but also leaders in virtually every sphere of life. The institution prides itself in giving its students the ability to develop skills not just in regard to advocacy and legal reform, but also in various literary and cultural spheres in order to provide an environment of all-round development, with the intention of fostering leadership and character building in each of its students. With this objective in mind, the students and administration of CNLU have been organizing the CNLU National Parliamentary Debate for the past 6 years. CNLU National Parliamentary Debate presently in its 7th edition, is a 3 day national debating event which witnesses participation from premiere institutions from across the country. Previously, it was a part of CNLU’s annual Festival- “Jeevatva” but this year the CNLU National Parliamentary Debate is being organized as an independent event due to the major success and acclaim it received in its previous editions. The 7th CNLU National Parliamentary Debate will follow the 3-ON-3 ASIAN PARLIAMETARY debating format while the (N=1) rule will be enforced for the adjudicators, i.e., each team must be accompanied by one adjudicator. This being an OPEN TOURNAMENT, people from across the length and breadth of the country are welcome to participate, not only as debaters but also as adjudicators. Cross teams are also welcomed. This is being done with the intention of providing an immensely competitive environment and ensuring meticulous judgment in the tournament. Click here to Register as Institutional Team. Click here to Register as Cross Team. Click here to Register as Independent Adjudicator.